This is a foreign exchange guide to Andorra, the Euro currency plus EUR transfers and travel tips. Euro exchange rates - latest & historic exchange rates. EUR News - the latest Euro related articles from our blog. What is the Euro currency code and symbol? The three letter currency code for the Euro is EUR and the symbol is €. It is the domestic currency in Eurozone, Aaland Islands, Andorra, Austria, Belgium, Cyprus, Estonia, Finland, France, French Guinea, French Southern Territories, Germany, Greece, Guadeloupe, Vatican City, Ireland, Italy, Luxembourg, Malta, Martinique, Mayotte, Monaco, Montenegro, Netherlands, Portugal, Reunion, Saint Barthélemy, Saint Martin, Saint Pierre And Miquelon, San Marino, Slovakia, Slovenia and Spain. The euro (ISO: EUR) is involved in slightly more than 30% of all foreign exchange deals, and as such, is the world’s second most traded currency, behind the US dollar. The euro is the currency of the eurozone (officially called the ‘euro area’), which consists of 19 of the 28 member states of the European Union, and is used by almost 350 million Europeans. It was introduced in January 1999. Of all the thousands of exchange rates that exist in the world, the euro-to-US dollar exchange rate is the most actively traded, or most ‘liquid’. Since its introduction, the euro’s lowest value against the dollar came in October 2000 when EUR/USD hit lows of 0.8231. The currency was strongest in July 2008, shortly before the worst stage of the 2007-2009 financial crisis, when EUR/USD reached 1.6038. There are currently more than twenty nations and territories which peg their currencies to the euro, the largest of which is Denmark. The interactive chart below shows the USD to EUR exchange rate for the previous 3 months with rate alerts for days when the exchange rate moved up or down significantly or for 30 day highs and lows. With its 468 sq km of tumbling valleys, Romanesque churches and sky-reaching peaks wedged between France and Spain, Andorra offers by far the best ski slopes and resort facilities in the entire Pyrenees. Once the snow melts, there's outstanding walking, ranging from easy strolls to demanding day hikes in the Principality's higher, more remote reaches, where you can wander for hours, almost alone. Bustling capital Andorra la Vella is crammed with traffic and duty-free day trippers, retaining just a sprinkle of character in its centuries-old Barri Antic. That's all soon forgotten, though, once you strike out above the tight valleys. According to local legend, Andorra was founded by Charlemagne in the 9th century. Until the 1993 proclamation of its constitution, this Catalan-speaking minicountry was jointly governed for over 700 years by two co-princes: Spain's bishop of Urgell, and the French president, who remain honorary heads of state. In summer Andorra is renowned for its gorgeous trekking routes. What currency to use in Andorra? Andorra is not part of the European Union or the Euro zone, even though it uses the Euro. In fact, Andorra has never had its own currency. Before the Euro was introduced, it used the Spanish peseta or the French franc. Shops and businesses accept all kinds of credit cards, meaning that you won't encounter any problems when making purchases or carrying out any other kind of financial transaction. How to get around in Andorra? Andorra is well served by the Cooperativa Interurbana Andorrana network of buses linking the capital with destinations across the principality, which operate regularly from 7am to 8.30pm or 9.30pm. Rates are between €1.80 and €6.10, depending on how many zones you travel through. Driving is by far the best way to explore Andorra. With all those narrow mountainous roads, however, it's important to keep an eye on weather conditions and winter snow reports, which are monitored live online at www.mobilitat.ad. Car hire costs from around €50 per day, but is cheaper with longer-term rentals; you'll need a valid driving license and credit card. It is not possible to travel here by train. 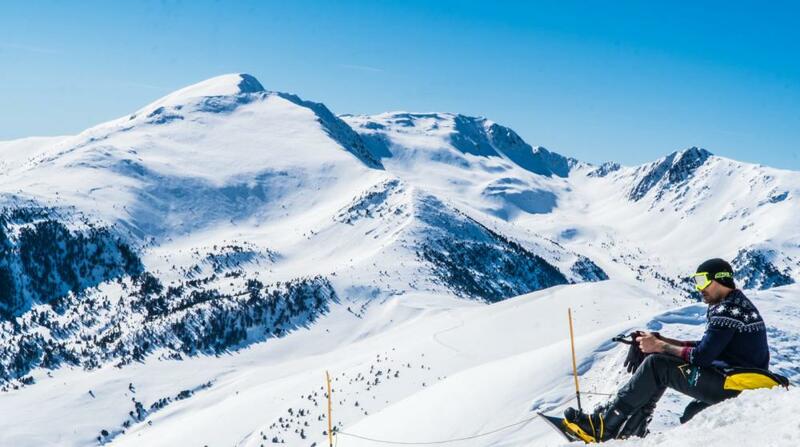 Andorra has some of the best Skiing sites in Europe. The country has a stunning mountainous landscape – the average elevation is 1,996m – and whilst skiers and snowboarders flock here in the winter to make use of the snow, the natural geography makes it a superb summertime destination too. Once the snow melts, the ski slopes of Grandvalira become the highest golf course in Europe; the Soldeu Bike Park has more than 100 km of free-ride, cross-country, endure and slope style routes; you can camp by the side of glacier-fed streams; and there are numerous walking trails, all with picturesque picnic stops. There are 13 Via Ferrata routes, which combine trekking and rock climbing, and for an unforgettable experience, you can even scramble these routes at night! Beginners should try the Creu de Noral or Sugudet from Ordino; but if you’re a serious climber and want something to get your teeth into, the Canal del Grau from Canillo is said to be fiendishly difficult. In and around Canillo are a dozen historic religious sites, which collectively form the Canillo Cultural Circuit. You can see them all by car or, if you have time, it is well worth walking between them, as though you were a pilgrim. Citizens from the EU countries, UK, Australia, Canada and the US do not need a visa to travel to Andorra. Tourists can also stay within Andorra for a period of no more than 3 months. Save money and time by Ordering your Euro online from Travelex, you get better rates and can pick up the EUR cash locally or even on travel day at the airport. For card purchases if offered a choice of currencies always select to Pay in Euro otherwise you may get much worst exchange rates. Compare EUR travel cash rates - probably why you are here! When searching around for information on how to get a good exchange rate when sending money to Andorra you need to start with finding out the latest Euro foreign-transfer exchange rate. Once your funds are received by the provider the converted EUR amount will be transfered to the recipient account you specify in Andorra. Use our Send to EUR calculator to compare the exchange rates of FX specialist providers rates versus your bank's standard rates you can hopefully save around 5% and maybe more - end result is more Euro deposited into the recipient bank account and less margins and fees kept by the banks!